Clement died before Michelangelo could begin the project, but his successor, Pope Paul III (1534–49) renewed the commission. The artist completed the fresco in 1541 to great acclaim. It was admired for its religious power. 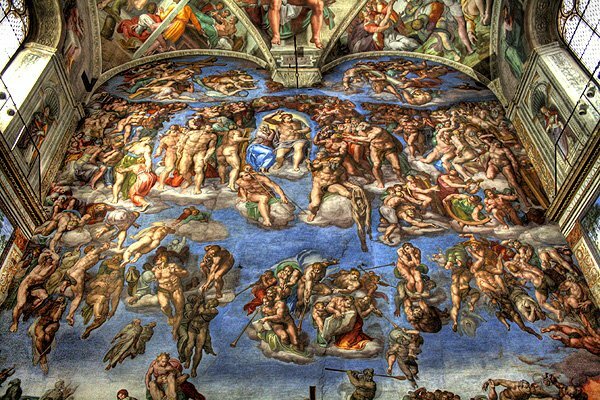 Paul III allegedly fell on his knees when he fi rst saw it and exclaimed, “O Lord, charge me not with my sins when you come on the day of Judgment.” It was equally admired for the genius Michelangelo showed in rethinking and executing a standard subject in medieval painting. Cardinal Francesco Coronaro wrote that if Michelangelo gave him a painting of even one of the figures he would pay him whatever he asked. Although commissioned as “the resurrection,” the painting has always been known as The Last Judgment, which is appropriate because the resurrection and the judgment are in Christian tradition but two aspects of the same reality. You will note that the painting displays plenty of naked fl esh, which is of course a hallmark of Michelangelo. The display here is, however, appropriate according to the Latin version of the Creed that Michelangelo and all associated with the papal court would have known—not “resurrection of the body,” as the English has it, but “resurrection of the flesh,” carnis resurrectionem.